Sunday I had set aside most of the day to do writing. I knew I only had about 20 pages left to reach the end of the manuscript and with only evening plans I set about to get it done. Well, I didn't finish. I got 4,140 words written (about 14 pages) and was like, I'd rather pickle something right now. After sitting on my bed for three and a half hours I felt I deserved a break. I've come to realize something, this being the fifth manuscript I've written (though it will only be the third that I've published). When I get close to the end of a story I really procrastinate. I feel like I'm coming to the end of a journey and I'm not ready to be done and move on. So I purposefully drag it out. Bug was beside me napping and Beans was at the foot of the bed enjoying the warm breeze through an open window. For Boston, it was a gorgeous day. Eighty-something degrees, sun and a breeze. I would have loved to have spent it at the beach but I'd promised myself I would finish this. So my procrastination method? 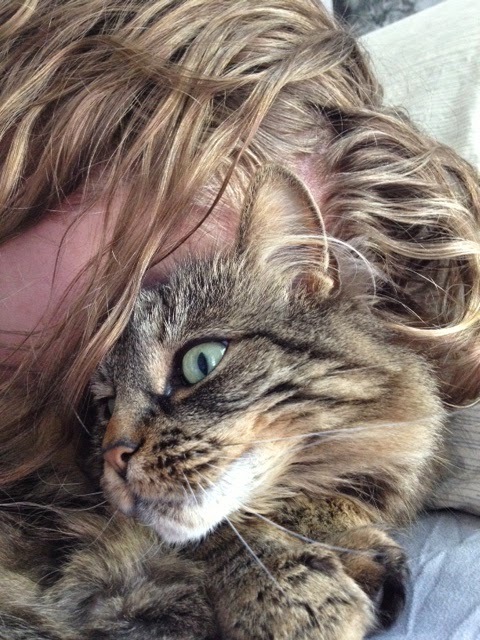 Smothering my cats. Bug was less than thrilled when I interrupted her nap to lay on top of her. 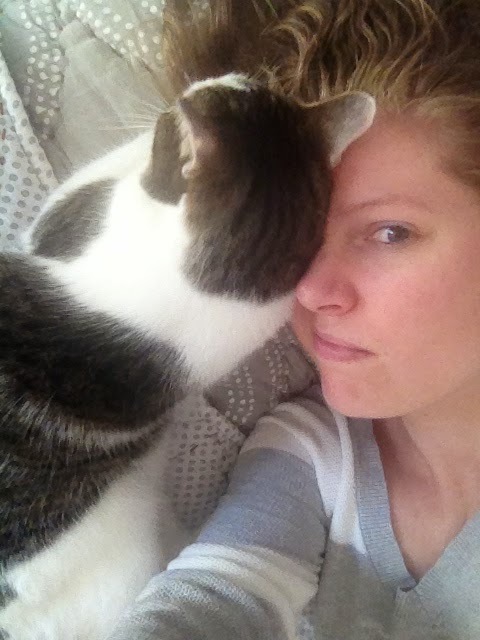 Beans, however, is always up for the task of laying on my face. She does not understand how to spoon. It's really quite sad. And I definitely got cat hair in my eye. So cuddles taken care of and 4,000 words written, I decided to get up off my bed, turn off the computer, and pickle something. Kaitlin had requested dilly beans. What are dilly beans? Autocorrect on my phone wants to call them "silly beans". I'm not sure that's far off. 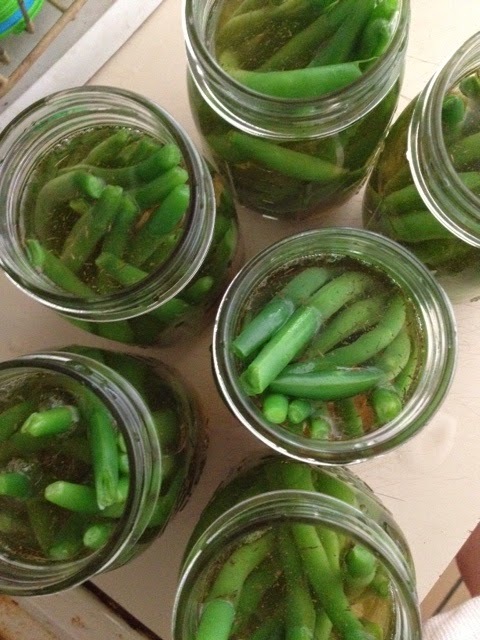 Dilly beans are green beans pickled with dill and some spice. A recipe in my preserves cookbook suggested using them for garnish with bloody mary's. Seeing as I don't drink those (Drink tomato juice cold? Gross.) I'm not sure what else they can be used for. But I'm going to find out! 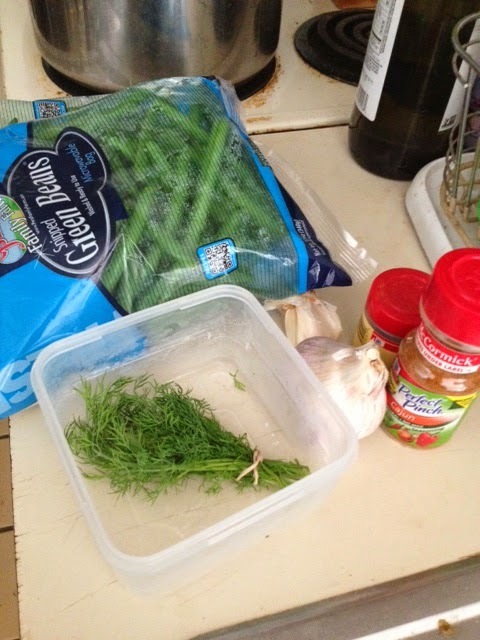 Fresh dill was one of the items in this past week's farm share. I love dill something fierce. I put it in egg salad, tuna, omelets. I love the smell. Kaitlin's farmer friend pickles the beans with jalepenos. Since that hot pepper jelly incident I've been hesitant to cook with hot peppers. The recipe in my book called for cayenne pepper. I didn't have any in my spice collection and I wasn't in the mood to buy any so I substituted with what I had - cajun spice. So. cook the green beans for two minutes in boiling water then remove and put into an ice bath (this prevents them from continuing to cook). 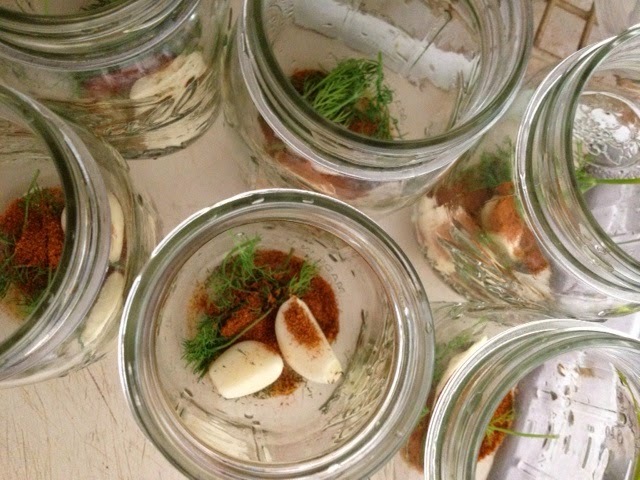 Meanwhile, in your 6 mason jars place 1-2 garlic cloves (I'm in the more is better category here), a couple sprigs of dill and a small shake of dried dill. I love dill. Then, depending on your preference jalepenos, cayenne pepper or cajun spice, put 1/4 teaspoon in each jar. 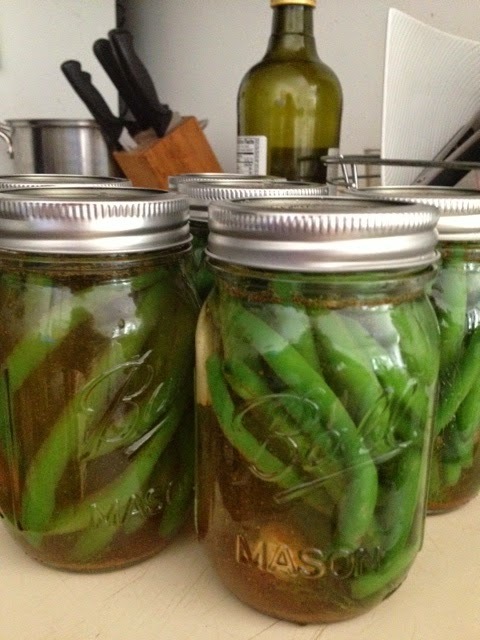 Fill each jar with green beans! Then fill to the bottom rim with vinegar. 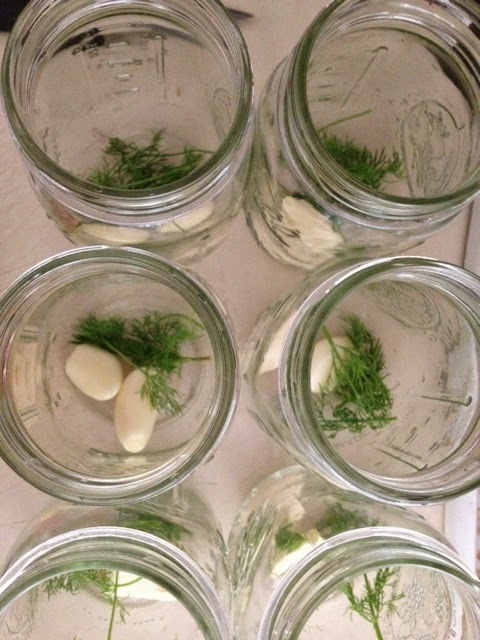 If you're going to can them to keep for a long time then follow proper canning instructions. I'm planning on gifting these with the intent to be eaten immediately so I just screwed the tops on, gave them a good shake and stored them on a shelf for a few days. Kaitlin, I hope you're ready! As a follow up to the pickled veg from a week or so ago, they were a hit with everyone! I can't wait to make more. We'll see what arrives in this week's farm share! Molly invited me to go with her to a concert back in 2009. She'd been to a Gavin DeGraw concert and loved his opening act who was returning to Boston to headline his own tour. 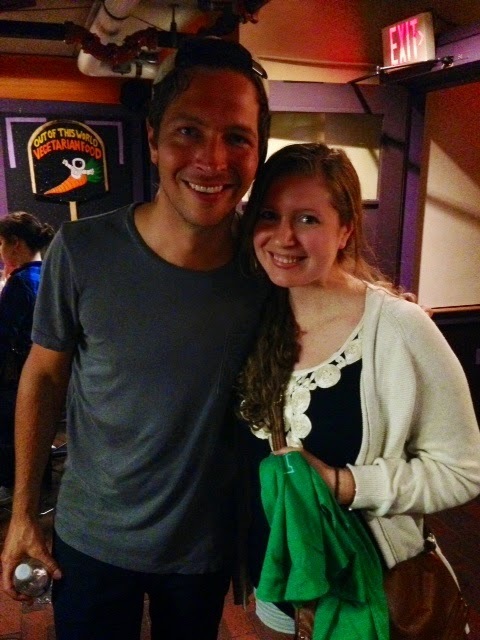 Being a lover of all sorts of music I said yes and we went to The Paradise to see Matt Wertz perform. I fell head over heels for the music (and let's be honest, him as well). In that concert he played a song, "Sweetness in Starlight", and made a comment beforehand that he dreamed of it being a prom song. Following that concert, I worked on a manuscript that I didn't end up publishing (but maybe I will one day) and wove that song into a pretty important scene. Since then, Molly and I have seen him together a total of seven times. Basically every time he comes to Boston we buy tickets. Over the years, and the course of our friendship, Matt's songs have been the soundtrack. When the weather's nice enough to drive with the windows down and the sunroof open we like to blast "Carolina" and "Heartbreaker" and sing at the top of our lungs. Sunday night he played at Club Passim in Harvard Square (the second time we've seen him at that venue). Going into the weekend Molly said, "We are going to get a picture with him. It's time." Truthfully, I didn't think it would happen. I'm not the type of person to go up to a stranger and ask to take a picture. Matt is a class act. He puts everything into his performance, takes requests from the crowd, and usually has a bit of banter with the audience and whoever is performing with him. Sunday night he was downright hysterical. After the show I was buying a shirt (my fourth - what can I say, they're the perfect shirts to sleep in) when I heard behind me, "Hi, I'm Matt." After Molly chatted him up we quickly took pictures with him and then headed outside in search of froyo (it was only fitting). 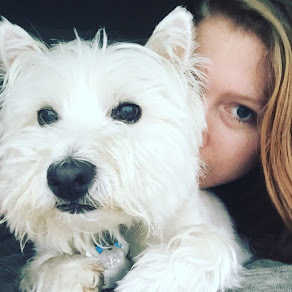 Molly turned to me more than once to ask, "You're so calm right now. How are you not freaking out?" My response, "Because I'm doing a little dance in my head." So that was my Sunday in a nutshell. Pretty awesome day, which could only have been made better if I'd fit in catching a few waves. But there will be many more weekends ahead to do that. So many more good ones, but start with those. Who ever thought Dilly Beans and Matt Wertz would appear in the same blog post? 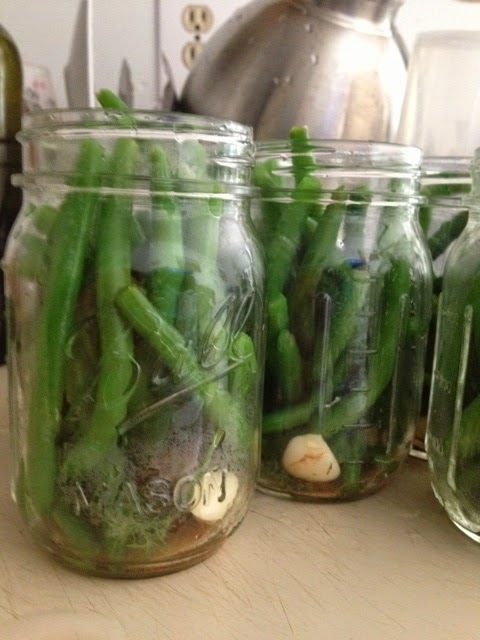 Love Dilly Beans, so glad you've added them to your pickling repertoire. Our Sunday night date with Matt was incredible. I can't believe you doubted we'd get a photo. We had set our minds to it! That evening is one for the record books.